One of the smallest of Lord Fitzwilliam's print albums, which formed part of his library and are usually devoted to the work of individual printmakers. 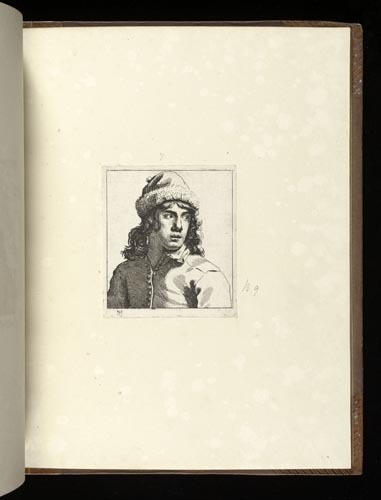 It is open at an etching by Sweerts of a young man wearing a fur-trimmed cap, from a series of 13 plates with a Latin title, Diversae facies in usum iuvenum et aliorum ('Various faces for use by the young and others'). This print and one other in the album have been squared up in pencil to facilitate copying, indicating that Sweerts intended the prints to be used by students for this purpose. The set was published in Brussels in 1656, the same year that the artist established a drawing academy in the city. Sweerts only etched a small number of plates (21 in total), but they are exceptionally rare: the set in this album is thought to be the only complete one in the world.